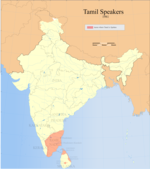 Lingua Tamulica seu Tamil (தமிழ் tamiḻ) est indigena Indiae et Taprobanes insulae sermo, qui ad divisionem australem familiae Dravidicae pertinet. Lingua Tamulica una est e duabus et viginti sermonibus Indiae schedulo enumeratis, unaque e quattuor "linguis classicis" hucusque pro gubernatione Indica laudatis. Causa migrationum recentiorum multi etiam in Malaesia et in insulis Singapura, Reunione, Mauritia hac lingua utuntur. M. S. Andronov, A Standard Grammar of Modern and Classical Tamil. Madras: New Century Book House, 1969. E. Annamalai, Sanford B. Steever, "Modern Tamil" in Sanford B. Steever, ed., The Dravidian Languages (London: Routledge, 1998) pp. 100-128. A. H. Arden, A Progressive Grammar of the Tamil Language. Madras: Christian Literature Society, 1942. Hermann Beythan, Praktische Grammatik der Tamilsprache. Wiesbaden: Harrassowitz, 1943. Francis Britto, Diglossia: A Study of the Theory with Application to Tamil. Washington: Georgetown University Press, 1986. Johann Philip Fabricius, Tamil and English Dictionary (olim Malabar-English Dictionary). 4a editio. Tranquebar: Evangelical Lutheran Mission Publishing House, 1972. Thomas Lehmann, A Grammar of Modern Tamil. Pondicherry: Pondicherry Institute of Linguistics and Culture, 1989. S. B. Steever, "Tamil and the Dravidian Languages" in B. Comrie, ed., The World's Major Languages, (New York: Oxford University Press, 1987) pp. 725-746. Novissima mutatio die 16 Aprilis 2015 hora 12:22 facta.